The "rod-lens" system of image transmission was a simple but radical departure from the lens system then in use. Instead of an air interspace between glass lenses, Hopkins used solid glass rods with lenses cemented between them. This dramatically increased light transmission and image definition and yielded images of a quality never before seen. These scopes provide a much wider viewing angle and smaller diameter than its predecessors, with improved resolution, contrast, and brightness. For more background on Hopkins or Storz, the author recommends 2 wonderful articles by Linder et al and Morgenstern. Today, endosocopy can be coupled with high-definition video and digital image-capturing systems to provide brilliant images for education. Currently, most otolaryngologists use telescopes ranging from 2.7-4 mm in diameter. Endoscopes are also available with angled lenses (30º, 45º, 70º) allowing for better visualization of the skull base, ethmoid, maxillary, and frontal sinuses. All of the images seen in this chapter are from a standard rigid rhinoscope. Rigid rhinoscopy allows for a complete and detailed visualization of the nasal mucosa, turbinates, and nasopharynx. This examination can be performed on adults and children who are able to cooperate with the examination. A wide variety of indications exist for rigid rhinoscopy, including inspection for inflammation in the mucosal membranes, the presence of purulent secretions, turbinate enlargement, or nasal polyps. A high-intensity light source is required. Most commercially available unites use halogen or xenon lamps. Xenon is white and the most natural in color. Halogen sources produce a slightly yellow light. Light from the light source is transmitted to the telescope through a fiberoptic light cable. Optical fibers are long, thin strands of glass that are bundled together to form cables. Light is passed from the light source through the optical fibers and flexible cable, without much degradation of the light signal. The light cable is attached to the telescope and the light continues through the rigid telescope. The scopes can be attached via a small video camera (charge-coupled device) to allow the surgeon to look at the video image on a monitor. Current generations of video camera integrate high-definition signals, allowing for 1080p images. Evaluation of the turbinates and nasal septum, which can contribute to nasal airway obstruction. No absolute contraindications exist. Relative contraindications to rigid rhinoscopy include a lack of patient cooperation. Nasal endoscopy and imaging are the 2 most widely used objective measures in the diagnosis of chronic rhinosinusitis (CRS). Endoscopy has multiple uses in the management of patients with sinonasal symptoms and plays an important role in both the preoperative and postoperative management of patients. The Lund-Kennedy endoscopy scoring system quantifies the pathologic states of the nose and paranasal sinuses. The scoring system assesses for the presence of polyps, discharge, edema, scarring, or adhesions and crusting. Endoscopic staging is performed bilaterally and typically takes place during the initial evaluation, preoperatively, postoperatively, and at regular intervals (3, 6, 12, 24, and 36 months recommended). The scores range from 0-20. Polyps are graded as absent (0), present in middle meatus (1), or present beyond the middle meatus (3). Discharge is graded as not present (0), thin (1), or thick and purulent (2). Edema, scarring, and crusting are each graded as absent (0), mild (1), or severe (2). Interrater agreement studies examining the reliability of the Lund-Kennedy endoscopic scoring system demonstrate that in a high proportion of cases, 2 independent observers agree on the examination findings. Topical anesthesia is sufficient to perform rigid rhinoscopy. Prior to passing the scope, the patient's nose is decongested and anesthetized with topical sprays. Most commonly, oxymetazoline is used first, followed by lidocaine spray. A rigid nasal endoscopy is used for the procedure. Some patients require pediatric-sized endoscopes for this procedure. At the minimum, rigid rhinoscopy also requires a light source and light cable. If the image is to be displayed on a video monitor, then a camera and camera control unit are necessary. The images from the camera are then displayed on a video monitor and can be recorded if a data archiving system is available. The patient should be sitting comfortably upright in an examination chair. Significant pain during the procedure or urges to sneeze should be relayed to the practitioner immediately so the procedure can be stopped and more anesthesia applied. Rigid rhinoscopy is a procedure used to examine the nasal cavity. Procedures can be performed simultaneously with the other hand as described above. Prior to performing nasal endoscopy, the nasal cavities are sprayed with nasal decongestant and occasionally a local anesthetic. The examiner then performs 3 separate passes of the scope in each nasal cavity. With each pass, the appearance of nasal mucosa is examined as well as the structures of the nasal cavity. In particular, the examiner notes the color of the nasal mucosa (pale vs hyperemic), the presence of inflamed or hypertrophic mucosa, the presence of nasal polyps or secretions (purulent, thick, thin), and anatomic abnormalities such as a septal deviation or spur, concha bullosa, or accessory ostia. Typically, a 3 mm or 4 mm 0º or 30º scope is selected first and an anti-fog solution is applied prior to introduction into the nasal cavity. The video below depicts rigid rhinoscopy. Rigid rhinoscopy. Courtesy of Hamid R Djalilian, MD. Starting with the patient’s head flexed, the scope is passed along the floor of the nasal cavity and into the nasopharynx. Examine the inferior meatus where the nasolacrimal duct drains and the inferior turbinate. As the scope is advanced posteriorly into the nasopharynx, examine for the presence of mucus or purulence draining into the nasopharynx. Examine the entire nasopharynx, including the eustachian tube orifices and the fossa of Rosenmüller. The endoscope is then passed between the middle and inferior turbinates to examine the inferior portion of the middle meatus and the fontanelles, as well as to look for evidence of accessory maxillary ostia. The scope is passed medially and posteriorly to the middle turbinate to examine the sphenoethmoid recess located medially to the middle and superior turbinates. The slit-like or oval ostia of the sphenoid sinus may be visualized with the superior turbinate during this pass. The scope is then, upon withdrawal, rotated laterally under the middle turbinate to examine the infundibulum, uncinate, and ethmoid bulla. Gentle medial pressure may need to be applied to the middle turbinate to allow insertion of the scope into the middle meatus. 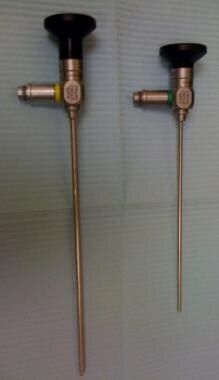 The third pass often requires a 30º endoscope or repositioning of the head. It should allow the practitioner to evaluate the olfactory cleft to look for any lesions or polyps in this region. Often the curvature of the septum allows this to be done adequately on only one side of the nose. Rigid nasal endoscopy is a safe and low-risk procedure. Potential complications associated with the procedure include an adverse reaction to the topical decongestant or anesthetic, pain/discomfort, epistaxis, and vasovagal episodes. Prior to administering the topical medications, the patient’s allergies should be verified. In patients with bleeding disorders (family history or personal history of bleeding disorders or current use of anticoagulants) care must be taken as nasal hemorrhage secondary to mucosal trauma may occur. Additionally, nasal biopsies obtained in these patients may result in a significant degree of hemorrhage. Medications that may be used during nasal endoscopy include decongestants and local anesthetics. Oxymetazoline is the most commonly used decongestant. Lidocaine (Xylocaine) 4% is a commonly used local anesthetic. Medications are typically applied using a spray atomizer or directly on cotton pledgets. Thomas E. Linder, MD; Daniel Simmen, MD; Sylvan E. Stool, MD. Revolutionary Inventions in the 20th Century: The History of Endoscopy. Archives of Otolaryngology - Head and Neck Surgery. November/1997. 123:1161-1163. [Medline]. Morgenstern L. Harold Hopkins (1918-1995): "let there be light...". Surg Innov. 12/2004. 11:291-292. [Medline]. Kumar M V V, Prasad K U R, Gowda P R B, S R M, P K C. Rigid nasal endoscopy in the diagnosis and treatment of epistaxis. J Clin Diagn Res. 2013 May. 7(5):831-3. [Medline]. [Full Text].